With three kids I find myself running washer and dryer almost every day. Then: folding, occasionally ironing, and sorting the items into the closets. At first I was pretty bad at it. We all were walking around in T-shirts that had a vertical straight line right in the middle marking the left-right body split. Then I discovered that it is considered a bad fashion etiquette and learned the expert shirt folding steps from my mother-in-law. Later, I taught my kids to do it. The same steps that salespeople use at the stores to fold the shirts so that they look neat and wrinkle-free. Now, my pile of folded clothes looked just perfect but it usually got crashed as soon as somebody needed the specific bottom shirt, pulling it out and scrambling everything on the top. Same was happening in our suitcases when we traveled: all the neat thoughtful arrangement was turned upside down in the first eve on the road. 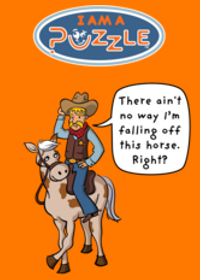 So, how does one fold and pack optimally? Pack so that all the items stay neat. Pack so that it takes the least amount of space. Pack so that one could easily find any single item and take it out without a major disturbance to the other items. Packing problems extend well beyond clothes – just think of all the large boxes you've received, ordered through online commerce, that contained small volume items and lots of Styrofoam peanuts or bubble wrap or air bags. Dissertations have been written about optimal packing, scientific wars fought and large prizes awarded. People have been inventing square tomatoes, space bags, nested dolls, and new polymer materials - just to minimize the packing headache. It looks like we have gotten around 15-20% of empty space in the rolled version. 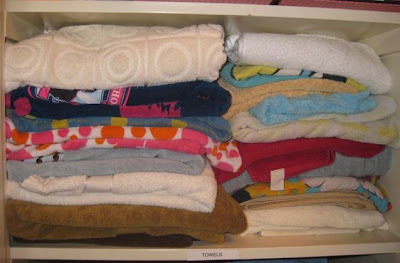 It is also much easier to see each towel. My daughter could easily pull her favorite one from underneath without turning the whole closet into a battlefield. In a folded scenario some tiny towels are obscured – I could spot only eighteen out of the twenty. Combining small and large towels on one shelf is much easier when they are rolled. 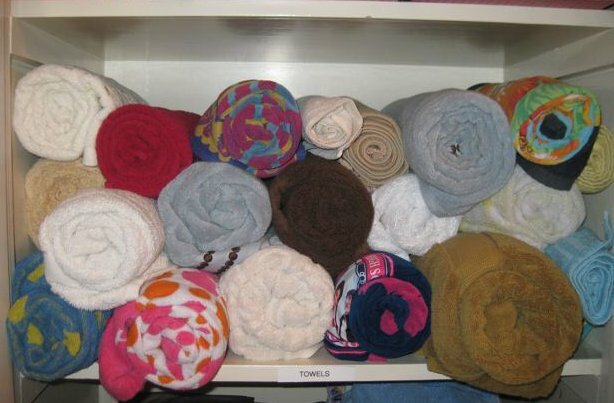 No collapsing towers of folded towels of various sizes. And most importantly, my daughter and I agreed, rolling was much more fun! One small change in our habits - one large optimization step for our closet. So, let’s Roll n’ Rock. Do you have your own packing and folding tips to share? Please post them in the comments below. Feel free to send your before-and-after images if you decide to give it a try as well. I will add them to the story. I have been rolling my larger things and it does take up less room. Things are easier to find in a suitcase and the creases are usually in the right place. One thing that especially helps packing is to put smaller things like underwear and socks in plastic bags so they all stay together. Even better to use are the plastic zipper bags that sheets, pillow cases or some bags that has high end linen packaging.